Looking for a great place to cool off on a hot day? 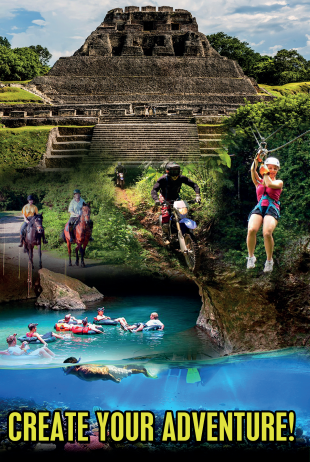 Toledo District, the southernmost district in Belize, has some of the best places to swim in a beautiful outdoor setting. One of the finest places to swim is located in Blue Creek Village. A traditional Maya village as well as home to several Mennonite families, the village is located next to a 200-acre (81 ha) rainforest preserve. Inside that reserve is the legendary Hokeb Ha Cave. The entrance to the cave is in the side of a hill and is the location where an underground spring makes its way to the surface. 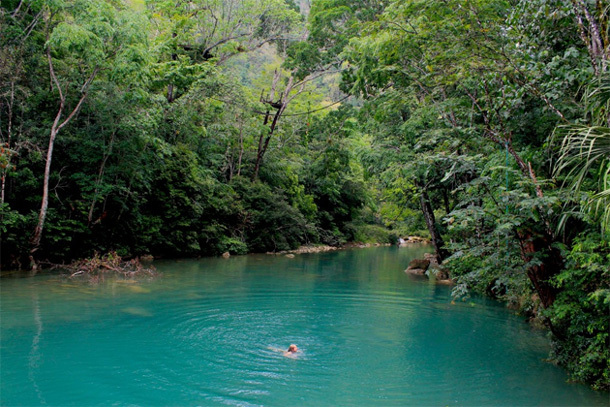 The spring-fed pools of Hokeb Ha Cave make it one of the best places to go cave swimming in Belize. There are several pools and lagoons inside the cave, each maintaining a constant water temperature of 75F (24C). Swimmers inside the cave can also make their way to nearby waterfalls. Note: For safety purposes, swimmers in the cave must be accompanied by a guide from the nearby research station or Blue Creek Village. Another great place to swim is the 500-acre (2,000 ha) Rio Blanco Waterfall Park near the village of Santa Cruz. From the main roadway, visitors must make their way down a mile-long jungle trail that terminates in two flights of stone steps that lead to the waterfall. The Rio Blanco waterfall has several shallow pools and small cascades that make it an ideal place to go swimming. There’s also a stone ledge 20 feet above the water that is used by thrill-seekers to jump into the pool. There is also a great picnicking area adjacent to the water. And near the village of San Antonio lies the San Antonio Waterfall just a few steps from the main road. This waterfall is rather small, cascading just eight feet to a large pool below. Although the water is only half a foot deep (15 centimeters), it is delightfully refreshing on a hot day. Last but definitely not least, the Golden Stream waterfall just off the Southern Highway near the village of Golden Stream is another great swimming spot. Several adjacent waterfalls pour into a large pool of water that ranges from two to six feet (60 to 180 cm) deep. 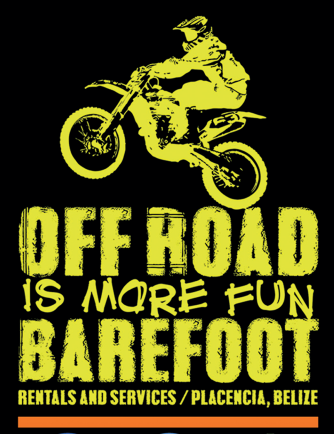 If you’re interested in exploring Toledo District, you can rent a vehicle from Barefoot Rentals and Services. Based in the Placencia Peninsula, Barefoot provides rental vehicles to travelers throughout Belize.